Create (gourmet burgers and frozen custard) was on a lot of “best of” lists for Las Vegas burgers. Accordingly, Happy Meal and I were obliged to make the ten-mile trip from the strip to seek out this much lauded burger and highly popular custard. The first thing that we noted was the friendly staff. Even though it was an hour before closing on the Fourth of July, we were treated like they had been looking forward to seeing us all day. This was also the case for the mini rush of customers that followed us. Beyond that, the place was immaculately clean. There wasn’t a speck of dirt or dust to be found. The cleanliness was refreshing, and it spoke to a meticulous attention to detail in the three-year old establishment. The management staff, Warren and Adnan, was incredibly attentive and happy to provide accurate answers to all of my inquiries. Again, this was an hour before closing on a holiday! Oh, they were focused on being "green.". This was excerpted from their website. We are commited to drastically reducing the typical "waste stream" restaurants experience. We have an energy efficient dish machine for our plates and beverage cups. ALL food waste(green waste) will be composted including our "corn cups" that will be used for our frozen custard. While they look like plastic cups they are actually 100% compostable and made of corn. ALL "disposable silverware" and straws are made of either sugar cane or corn and are 100% compostable. The ordering process at Create was centered on customization. The first choice was the weight of the burger patty—from 2.5 ounces to ½ pound—one could actually order a burger as large as one wanted, but the menu prices only contemplated the standard choices. There were 5 bun offerings. There were 8 types of cheese to select from. I counted 20 free toppings selections and 5 premium toppings. Finally, they offered 24 different sauces. This meant that one could go to Create at least 480,000 times and never have an identically assembled burger. In truth, since one could have more than one sauce or topping on each burger, the number would actually be many orders of magnitude higher--I just got lazy on the math. Out of the billions of potential combinations, Happy Meal and I went with a couple of 1/3 pound burgers on white Kaiser-style buns with American cheese. Happy Meal got the standard fries, and I ordered onion rings. This and a couple of soft drinks set us back about $17. Less than 8 minutes later, our burgers arrived at the counter where we were seated. The Beef: The beef at Create was sourced from Sysco Foods. It arrived pre-ground but never frozen. This was 100% Angus Chuck. The Med-Well cooking temperature of my burger melted enough of the collagen in the patty to develop a nice beef note. The beef was not oily, and it was not especially juicy. Juiciness would have been a tall order of a thin, 1/3 pound patty. Nonetheless, the burger was not dry. Overall, the flavor of the beef was good. Happy Meal was very pleased with his burger. The flavor of the beef appealed to his young palate. His burger was gone before I had eaten the first half of mine, and he had already moved on to sample the frozen custard. The Seasoning: The exterior of the burgers were dusted with a proprietary blend of salt and spices just prior to the cooking process. The seasoning was light but satisfying. The Sear: The sear was present mostly around the edges of the burger, and there it was crisp and hearty. The center of the burger did not benefit from that sear, but it did pick up a hint of char and smoke from the open flame cooking process. The Preparation: The medium grind beef was formed into patties in the Create kitchen on a daily basis. 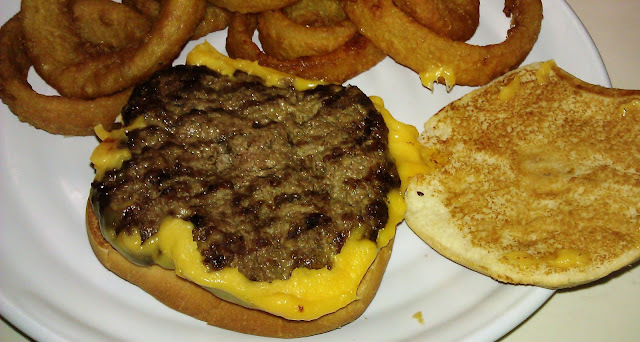 At the time of an order, the appropriately sized patty was seasoned and placed on a metal conveyor belt, which ran through an open-flame double broiler. This was a lot like a conveyor pizza oven, but this one had flames visibly interacting with the beef. From there, the cheese was applied to the burger patties, and then the assemblage was sent through a second broiler. This one was a little less intense, but it melted the cheese perfectly. This was a smart way to ensure consistency, and to reduce cooking times. The Cheese: The American cheese was the star of the show. The thick slice of yellow goodness was especially savory, and it brought strong notes of iron and umami. This rounded out the flavor profile of the mild beef. The texture was wonderfully gooey and creamy. The cheese was present throughout the entire bite, and this presence was most welcome. The broiling process lightly browned the cheese, and this really made it pop. I didn’t check to see if they had different cheese slices for the various burger weights. The portion of cheese, which the 1/3 pound patty received, was ideal. The Bun: The plain, white, Kaiser-style, hamburger bun was also sourced from Sysco Foods. It was fresh, moist, mildly sweet, and lightly toasted. The toasting provided some crunch around the edges. The bun was nearly undetectable in the presence of the cheese and beef, and that was fine. The Meat To Bun Ratio: This was ideal. The Toppings: I skipped the bounty of vegetation choices that Create had to offer, and I ordered a few of the sauces on the side. The Atomic Mayo was an impressive and fruity blend of Scotch Bonnet pepper sauce and mayonnaise. The heat came on fast and strong, but it dissipated mercifully quickly. This potent and tasty sauce was relegated to an onion ring dipping sauce, since I wanted to taste the meat and not the heat. The pesto mayo was what one might expect (in a good way), and the barbeque sauce was sweet and spicy. All of the specialty sauces were prepared in-house. 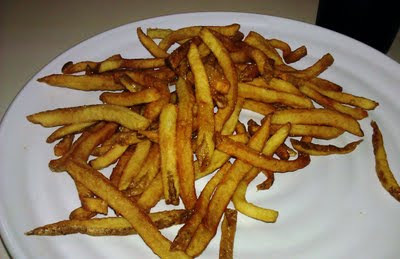 The Fries: The skinny fries were peel-on, and they were cut and par-cooked in house. They were cooked in soy oil to a perfectly crisp golden brown. The fries were nicely seasoned with salt as they came out of the fryer. Note: fried foods should be seasoned the moment that they exit the fryer oil. This allows the seasonings to adhere to the surface of the food. Once the food begins to cool, the seasonings simply bounce off. The Custard: The frozen custard at Create was one of the big draws. They were using one of the two Stoelting Ross custard machines in Las Vegas. The frozen custard was a delight. Happy Meal had the chocolate, and I tried the black cherry and the vanilla. The texture was dense and creamy. I tried in earnest to find a single ice crystal; I was unsuccessful in this endeavor. This frozen confection delivered a rich, smooth, and luxurious mouth feel. The vanilla was simply better than expected, and the other flavors also exceeded expectations. This custard was far better than any ice cream. The custard base was delivered to Create in a frozen form, and the staff at Create added the flavorings and assorted ingredients to create the basics and the daily specials. 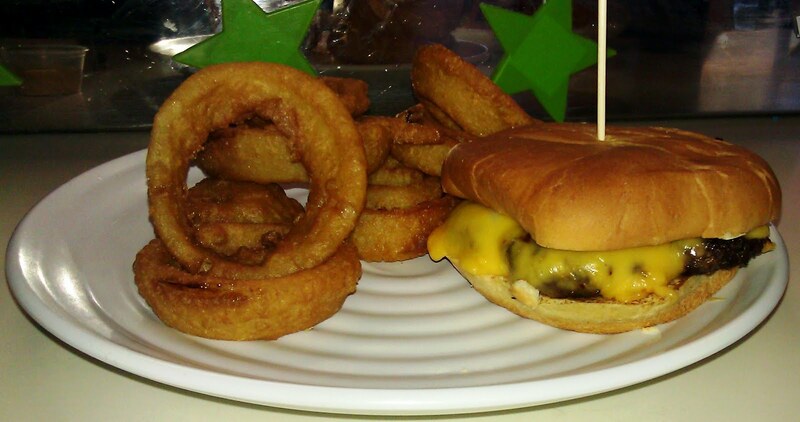 The Value: Two 1/3 pound cheeseburgers, fries, rings, and a couple of bottomless soft drinks came out to about $17. That was a fine value. We would have paid more at a Five Guys Burger and Fries. The fare at Create was just a little better than Five Guys and for a slightly lower price. Create was an actual oasis in the desert. The staff was refreshingly enthusiastic and earnest; the restaurant was spotlessly clean; the burger fare was fresh, flavorful, and infinitely customizable at a strong value. Finally, the frozen custard was world class. Create had earned a strong and loyal following with Las Vegas locals and deservedly so. Burger Review : Create served up some darn tasty burgers, delicious fries, and wonderful frozen custards. Go to Create.